John Hunter was born in 1839 in Cheltenham, Gloucestershire, England, one of eight children. John immigrated to the USA and on November 28, 1856 seventeen year old John married twenty year old Mary Anne Simpson, a local Mount Vernon woman who was born in 1836. John was one of stonemasons working on the construction of Kenyon College. There is no record he assisted in the construction of Quarry Chapel nor that he and his family worshiped at the Chapel. 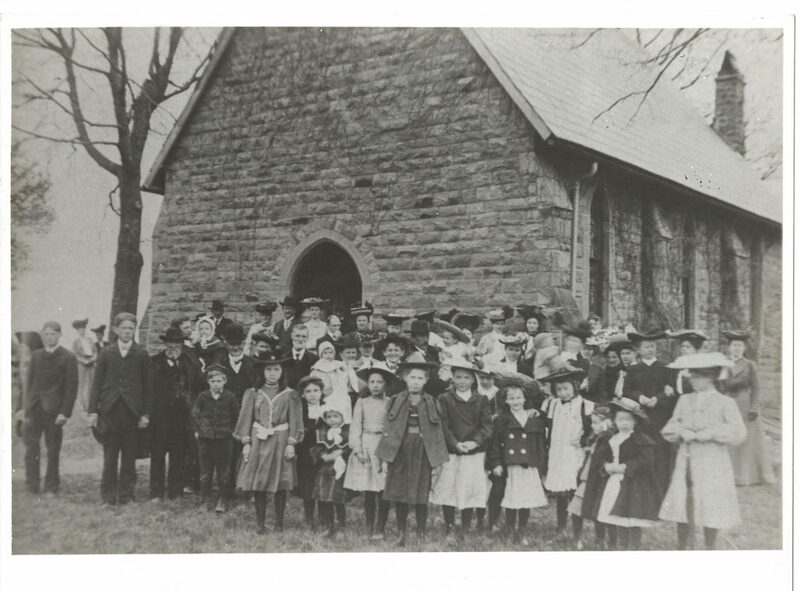 However, his son John, Jr.is identified as the person on the far left in the following picture of the congregation taken in 1904. John served in the Civil War. John died February 22, 1890 at the age of 51 in Gambier and Mary died December 17, 1897 in Mount Vernon. John is buried in Oak Grove Cemetery in Gambier, Ohio. Descendants of the Hunter family continue to be active with Quarry Chapel. If you are a descendant of the John Hunter family please contact us.